Celebrating 15 years of Flipped—a classic he-said-she-said romantic comedy! This updated anniversary edition offers story-behind-the-story revelations from author Wendelin Van Draanen. The first time she saw him, she flipped. The first time he saw her, he ran. That was the second grade, but not much has changed by the seventh. Juli says: “My Bryce. Still walking around with my first kiss.” He says: “It’s been six years of strategic avoidance and social discomfort.” But in the eighth grade everything gets turned upside down: just as Bryce is thinking that there’s maybe more to Juli than meets the eye, she’s thinking that he’s not quite all he seemed. This is a classic romantic comedy of errors told in alternating chapters by two fresh, funny voices. 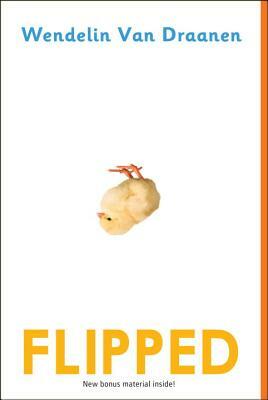 The updated anniversary edition contains 32 pages of extra backmatter: essays from Wendelin Van Draanen on her sources of inspiration, on the making of the movie of Flipped, on why she’ll never write a sequel, and a selection of the amazing fan mail she’s received. WENDELIN VAN DRAANEN was a classroom teacher for many years before becoming a full time writer. Her books include the Sammy Keyes mystery series, the Shredderman quartet, and the Gecko and Sticky quartet, as well as stand-out stand-alone titles: Swear to Howdy, Runaway, Confessions of a Serial Kisser, The Running Dream, and The Secret Life of Lincoln Jones. You can learn more about her at WendelinVanDraanen.com or on Twitter @WendelinVanD.